Thought about this again. Do you think Valkyrie, Korg and half of the Asgardian survivors run into Tony and Nebula as they are headed for Earth? I'd chuckle at that. Hopefully if Korg is in it they got Taika Waititi to voice him again. He was perfect as Korg. I think it's either them (going to Earth to find Thor) or Rocket (off in space to find his ship/Friends.) It would make sense for Rocket to want to find out what happened with the rest of the Guardians. I think it'll be Captain Marvel, bumping into Tony and Nebula while responding to Fury's mega-page. Also: Dr. Strange never did remove the curse/spell he put on the time stone. Could that have been why Thanos' arm was fried? Yeah, I hope not too. I just have such small hopes of her character actually being the badass they're trying to build her up to be. I'm afraid she's going to end up being a caricature. And......maybe? I just assumed the power required to pull a feat like that would just wreck the gauntlet, thus removing the comics tried-and-true way of stealing the gauntlet and fixing everything back to the way it was. Could definitely be part of Strange's machinations, though. "She’s pretty much the strongest character -- in terms of someone with powers are able to do things -- in the Marvel universe. So, for Carol Danvers to be that person and for Brie to become that person, it's gonna be a dynamite thing. I mean, [the Avengers] are up against some really, really tough odds right now -- we saw throughout Infinity War -- so now we know that we need something that's as powerful as Thanos. And at some point, we'll find out how powerful she is and all the things that she's capable of. She's one of the few people in the Marvel universe that can time travel, so..."
This really isn't a new theory it just combines the 2 most popular theories (multiverse/time travel) into one. 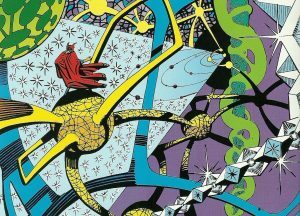 And the one leak I believe has the MCU combining the Microverse, (they lost the rights to this name,) the nexus of all realities (Dr. Strange is also the defacto protector of that realm,) and "The Crossroads" from the comix. The MCU quantum realm resembles all three at times and would allow characters to travel both in time and into and out of alternate realities. Dr. Strange's "shroom trip" in his movie had a few clips that were clearly meant to be the nexus of all realities and the crossroads. This pic shows the Beyonder traveling through all the different "realms" in the comics. Most of these have already been introduced into the MCU. I heard we're getting a Professor Hulk. If they use him like they did in the Comix it was easily the best incarnation. Why Hollywood insists on using a version of the character that equates to a 4 year old child while that version of the character didn't even exist for 30% of the character's run is beyond me.